Some of the most memorable travel experiences I’ve had on this planet are ones where I’ve felt like I was no longer on it. From hiking to an old stone fortress in Kotor, getting lost in a maze of underground passages in Sintra’s Quinta da Regaleira, or wandering around the ancient streets of Mdina, these experiences made me feel as if I’d crossed over into some alternate, storybook-quality realm. On top of having these surreal moments in Montenegro, Portugal, and Malta, I stumbled across one more otherworldly place in Slovenia: the Vintgar Gorge. 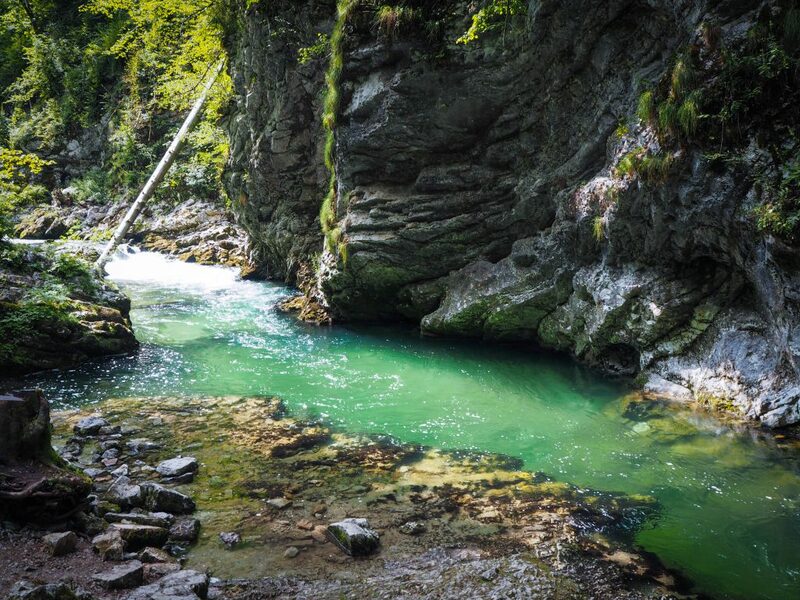 Considered to be one of Bled’s (and arguably one of Slovenia’s) top tourist sites, the Vintgar Gorge looks like it belongs somewhere in the vicinity of Oz’s Emerald City. During the summer months, lush foliage takes over the ravine, and it’s difficult to find a crevice without a splash of vivid green. But obviously, if someplace can potentially belong in or around Emerald City, the enchanting greenery in the scenery can’t end with the vegetation. And it doesn’t. 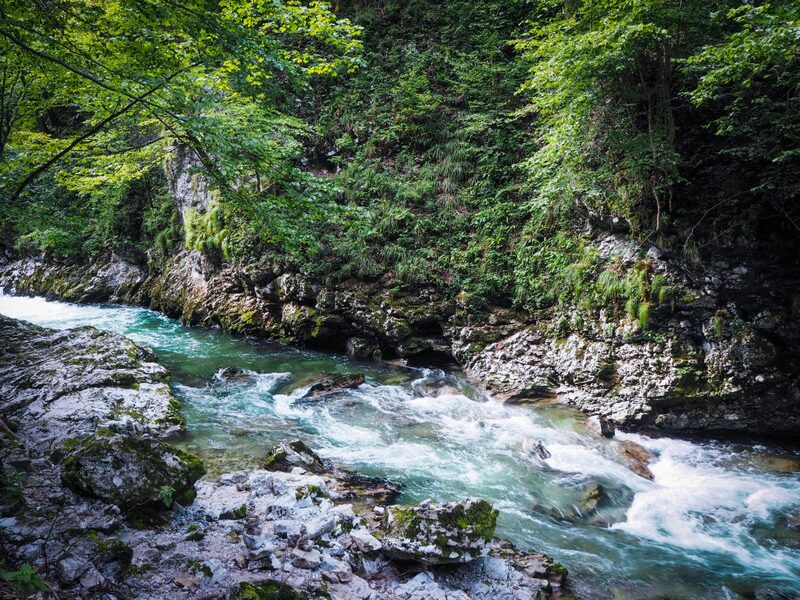 The Slovenian Radovna River has been carving out the spectacular Vintgar Gorge for thousands of years. It still runs through the ravine today. While walking along the gorge, you’ll catch sight of the river shapeshifting from rapids to waterfalls to segments of calm, crystal clear water. However, the river’s constant metamorphosis isn’t the most impressive thing about it. I dare say that the river’s deep emerald green colour is one of its most stunning qualities. 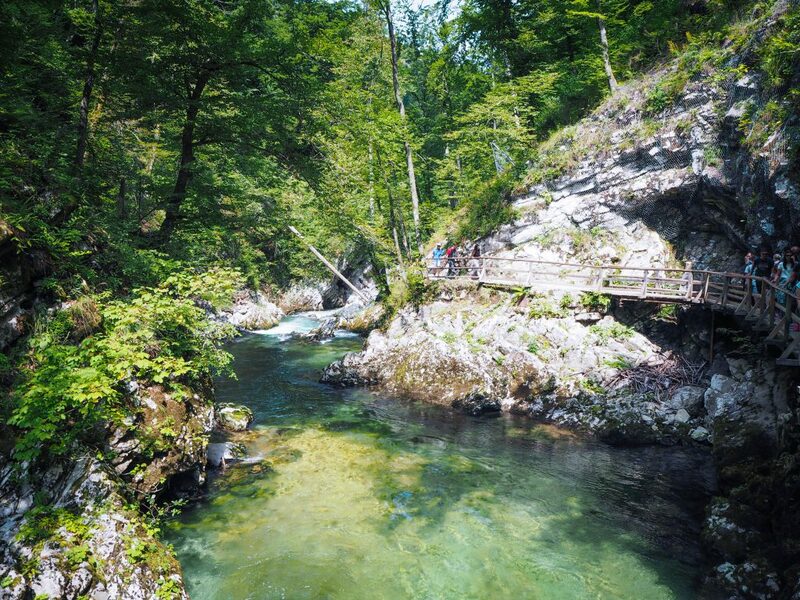 If this intro hasn’t already hinted at it enough, I’ll say it clearly: when spending time in Bled, Slovenia, the Vintgar Gorge is a natural wonder you must visit. Not yet convinced – maybe you caught me calling the gorge a tourist site? I’ll let the 15 photos of the Vintgar Gorge featured below do the rest of the convincing. Of course, I’ll also be sharing what you need to know in order to make the most out of your time at the gorge. The Radovna River in rapid mode. The colour of that water makes my jaw drop every time. The Radovna River in shapeshifting mode: a little bit of calm before a rapid storm. I’m a little bit green with envy about all the people who live in the area and get to experience this wonderful place whenever they please. Part of the path along the gorge. 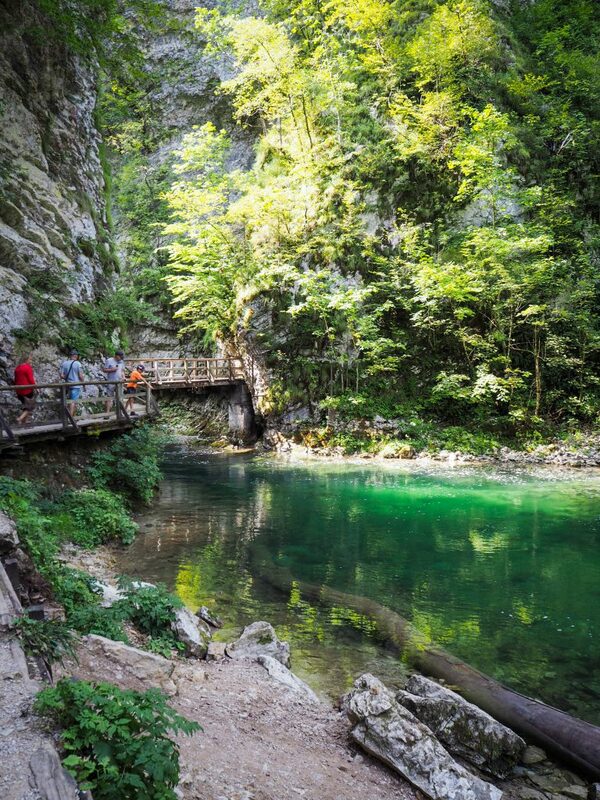 The over 100-year old stone bridge that’s part of the Bohinj Railway. 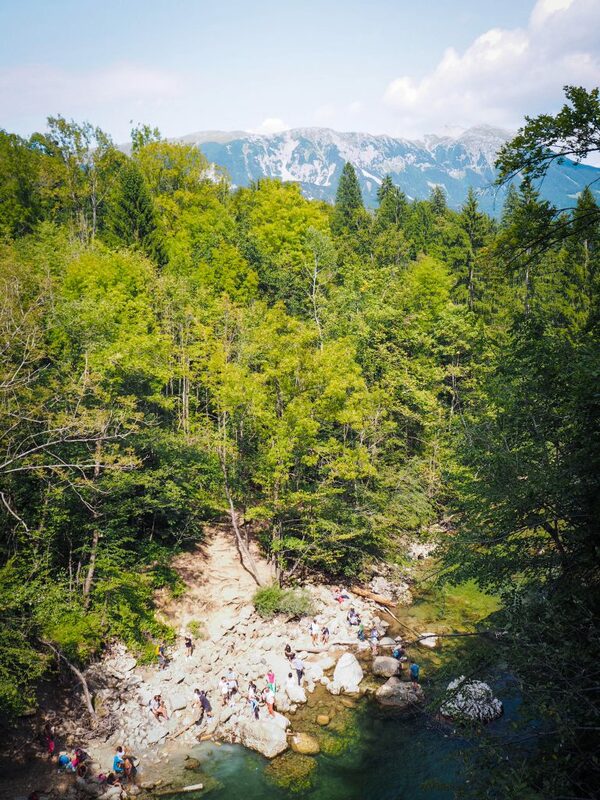 Catching sight of the Julian Alps at the end of the Vintgar Gorge. Where is the Vintgar Gorge? 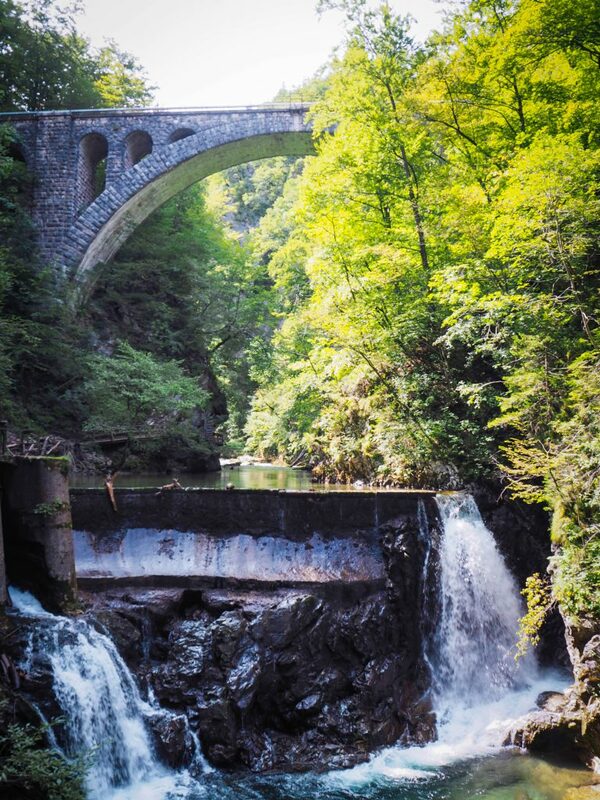 When Should I visit the Vintgar Gorge? The Vintgar Gorge is officially open to the public in the spring, summer, and fall. (It closes during the winter months for safety reasons). When its open, visitors can go in everyday of the week from 8:00 AM to 7:00 PM. 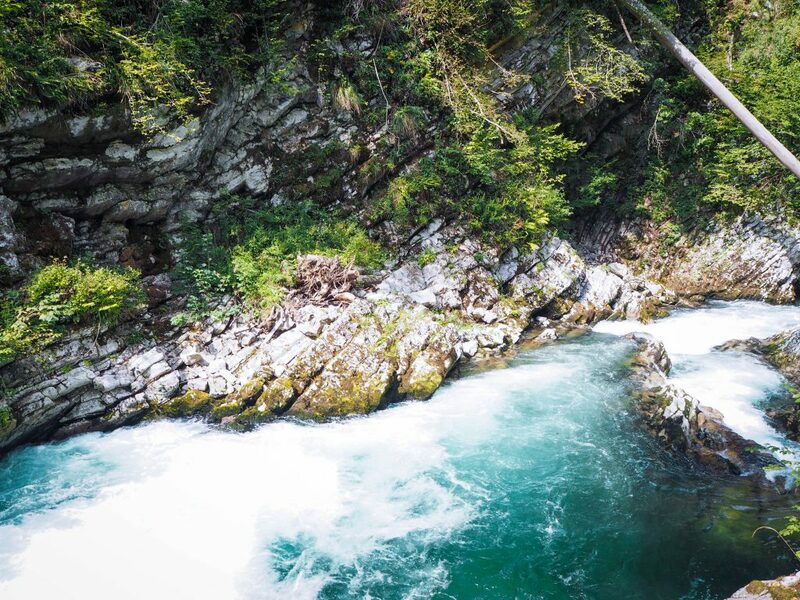 If you plan on visiting the Vintgar Gorge in early spring or late fall, click here to visit the gorge’s site for more information. If the opening and closing dates aren’t posted online, you can use the contact information found at the bottom of the page to inquire. While the gorge is capable of fulfilling anyone’s emerald dreams during the late spring and summer months, there’s no doubt that fall foliage will also make it one remarkable sight. 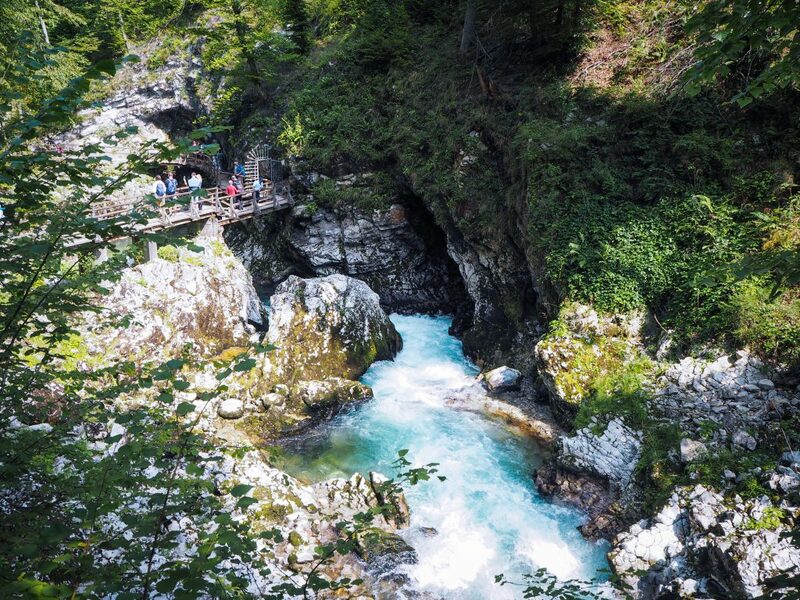 Most people visit the Vintgar Gorge during the summer months (July and August). If you also plan on exploring the gorge then, you can expect crowds. Consider going first thing in the morning or later on in the afternoon if you want to encounter fewer people. I visited the gorge in mid-August at 14:00 (2:00 PM). It wasn’t exactly crowded, but it also wasn’t too empty. However, visitor numbers started to dwindle closer to 16:00 (4:00 PM). There are many ways to reach the Vintgar Gorge from Bled. If you’re up for a bit of a walk and have around an hour and a half to spare each way, you can use your own two feet. You can also take a bike, a shuttle bus, or drive. Keep in mind that there are no designated pedestrian or bike paths along the country roads from Bled to the gorge, so if you do walk or bike, always be aware of the road traffic around you. 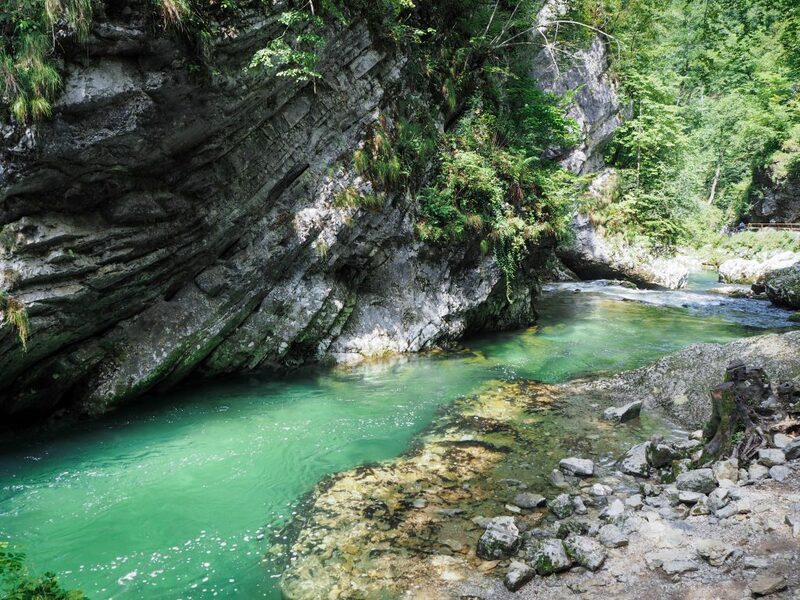 Nevertheless, Mamut Slovenija, a Slovenian outdoor adventure company, runs an hourly shuttle bus between Bled and the Vintgar Gorge. A round trip costs €5.00. This shuttle will drop you off right by the gorge’s ticket office and pick you up 2 hours later. Mamut Slovenija’s Bled office is right by the Bled bus stop. If you choose to drive to the gorge, there is free parking for visitors. Want to know more about what you can see and do in and around Bled? Overall, I would recommend setting aside at least 2 hours to explore the Vintgar Gorge. The ravine is roughly 1.6 km long, and you need to walk through it and back (that’s a 3 km+ walk total). If you’re an avid photography fan or want to take a swim by the waterfall (found at the end of the gorge), then you’ll definitely need a bit more than 2 hours. Depending on your pace, you could spend up to half a day at the gorge. The waterfall at the end of the gorge. 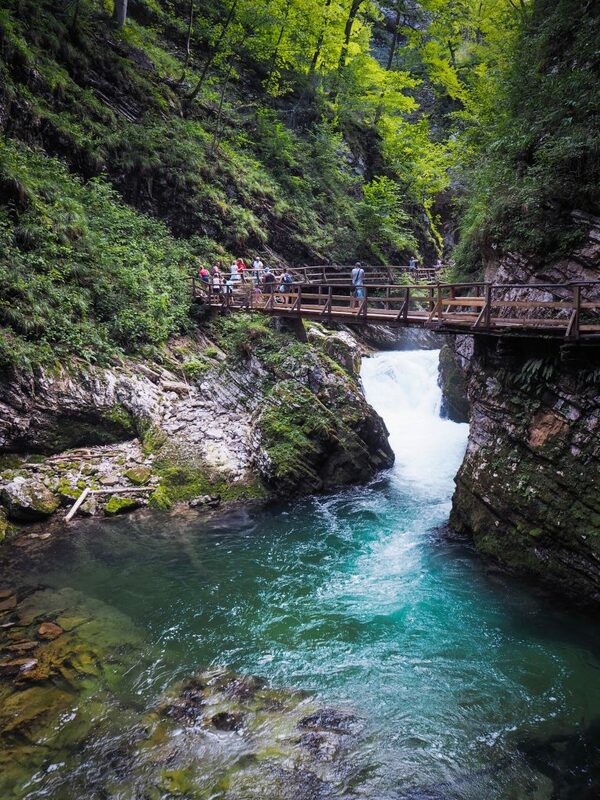 How much will a trip to the Vintgar Gorge cost? Not much. 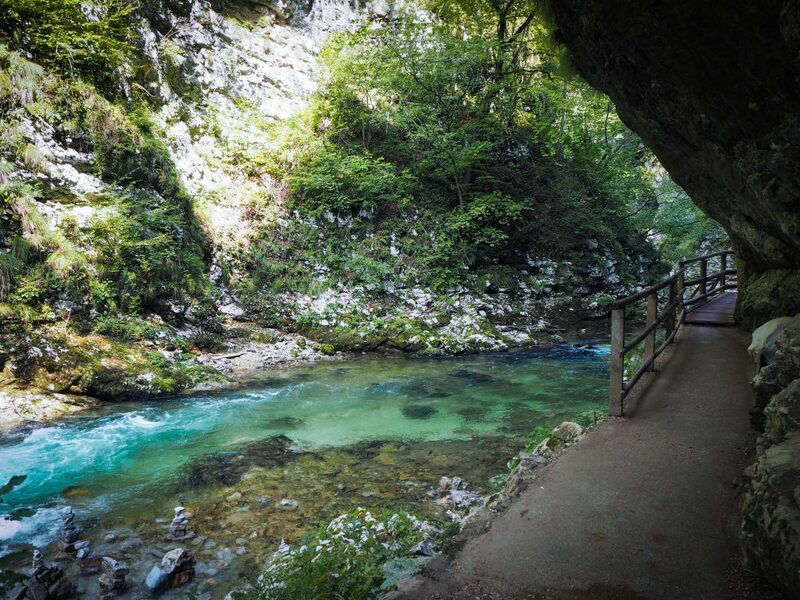 The Vintgar Gorge has an entrance fee, but it’s only €5.00 for adults. If you’re a student, you pay €4.00. Taking a shuttle bus with Mamut Slovenija costs an additional €5.00. Nevertheless, as mentioned earlier, if you choose to drive, parking for gorge visitors is absolutely free. Tip: If you opt for the shuttle and want to explore more of Bled, you can ask the shuttle bus driver to drop you off at Bled Castle on the way back to town. It will save you a 20-minute hike! A light sweater (even in the summer). The bottom of the gorge is pretty damp and shady, so you may get a little chilly. A camera (so you can avoid pinching yourself at the gorge to make sure that what you’re seeing is truly real. Take photos instead). Shoes with decent grip (parts of the path are wet and slippery). A bathing suit and towel if you want to swim. Snacks/small picnic if you’re planning on spending around half a day in the area. 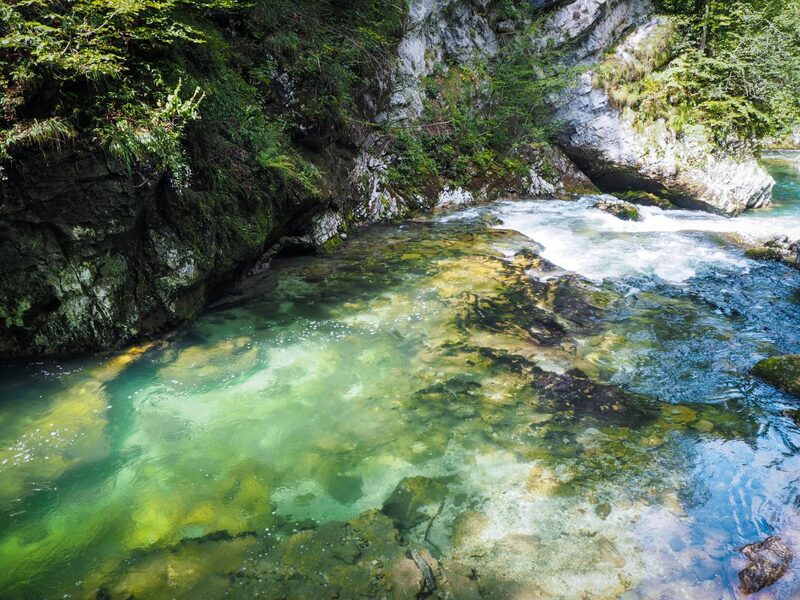 One of the best things about exploring the Vintgar Gorge is that almost anyone can do it. The walk is fairly flat, and as long as you occasionally watch your step, you don’t need to be an experienced hiker, canyoneer, or whatnot to walk along the ravine. Yes, the gorge is a popular tourist destination, but when given the chance to experience such a stunning natural wonder in person, no crowds were going to dissuade me from going. Speechless every time I lay eyes on this photo. All in all, after spending a week in Slovenia, I came to the conclusion that the country is full of enchanting experiences (I’m thinking of you Soca River, Predjama Castle, Metelkova, and more). I know that Slovenia is one country I will have to revisit soon, so if you’ve been, I want to hear about your favourite places and experiences! Feel free to share them in the comments section below! Those colours though!!! This looks amazing! Everyone goes on about Lake Bled and Ljubljana and I don’t hear much about anywhere outside of that. The colours are incredible! I agree – there’s not so much said about the Vintgar Gorge…until you get to Bled – then there are posters advertising it everywhere! What a beautiful place! 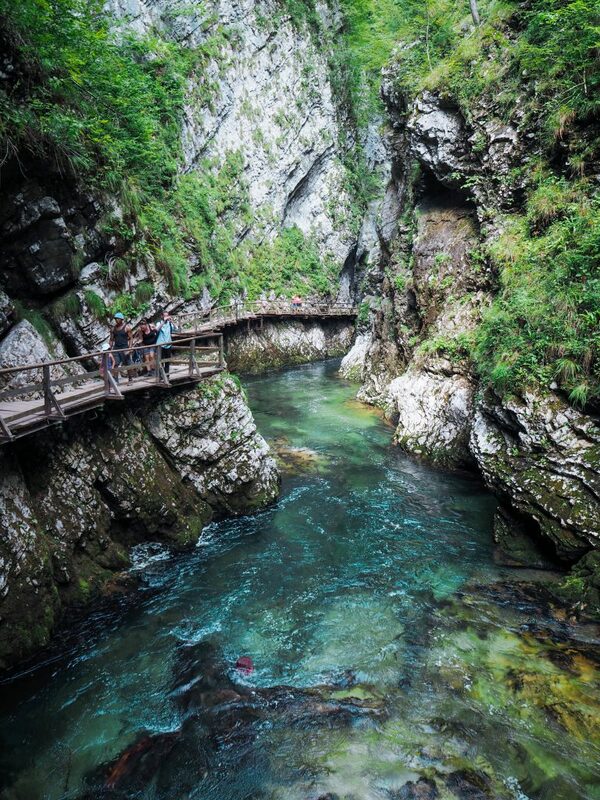 The more I read about Slovenia, the more I am convinced we should visit. Nice pictures! It’s an amazing country! Even though it’s small, it has everything (mountains, beautiful cities, and beaches)! I have actually trespassed to see Vintgar Gorge because when I visited Slovenia it was still closed for winter repairs. However, I just climbed over the fence and had the entire canyon for myself. I remember how fascinated I was by its beauty, by the rapids and the sounds of nature, without any other human being around. That sounds like an incredible experience though! Was the water frozen at all in the winter? 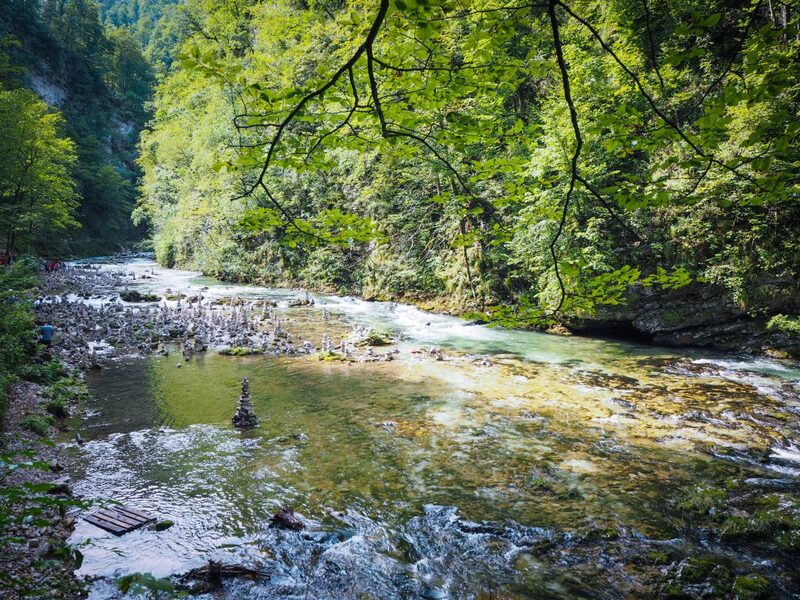 I have to admit I have a soft spot for Slovenia – I see it as this green & chic country, not boasting off its beauty but just silently showing it off to anyone interested to discover it! I’ve seen so little of it, but I’m definitely adding this gorge to my list! Wonderful place and captures! Wow the water is so green! What a beautiful place to visit! What a lovely place, you made some really pretty pictures! I grew up in Hungary yet never visited this neighbour country! I hope to change this soon! Bled and its sorroundings is definetely the area I would be happy to return. I didn’t know about Vintgar Gorge, so it’s one more reason for doing that. Thanks for sharing. Wow this spot looks absolutely beautiful! 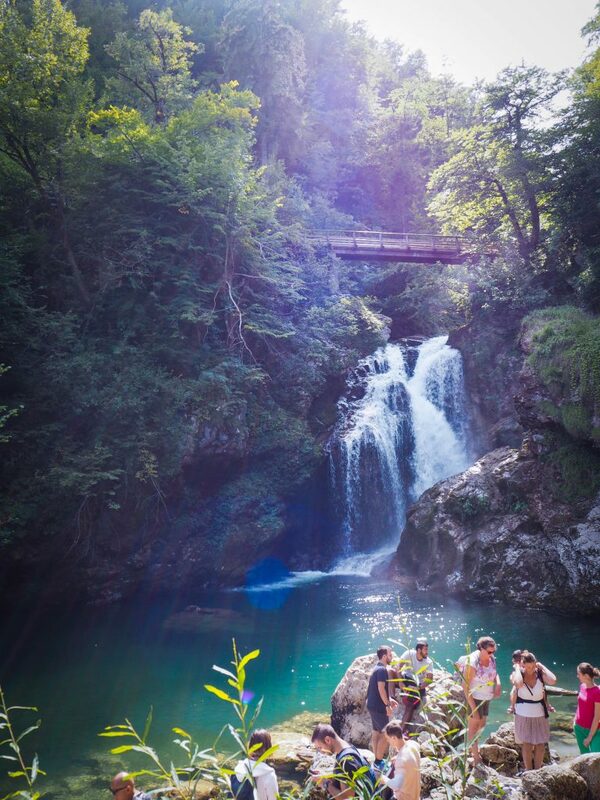 I’ve seen so many great things about Slovenia but hadn’t heard about this place until now. Definitely adding it to the list for when I get there. Thanks for sharing! You’re very welcome! I hope you get to visit the gorge! I would very much like to return to Bled and its sorroundings. I have never heard of Vintgar gorge, so it’s one more reason for doing that. Thanks for detailed information and great pictures. Thank you so much! It’s strange how the place is so beautiful, but it’s not advertised heavily outside of Bled. I hope you get to return to the area! Wow the gorgeousness of this place makes me wanna go now! Thanks for the info regarding best time to go! I want to go back and spend more time there! And you’re welcome! Your opening line is so powerful! This gorge looks amazing. Thanks for all the useful tips. I always like to incorporate some nature activities in my travels. Thank you so much! Writing inspiration hits in the most random of places and situations. I think I thought of this one while taking an escalator up to enter Stockholm’s bus station. It’s not heavily advertised outside of Bled. I hope you do get the chance to go next time! Looks like a wonderful place to visit and I love all the details you included! Thank you! The Vintgar Gorge really is beautiful!